Yesterday morning, I’m having breakfast at our kitchen table (fresh whole grain bread delivered from the boulangerie in the next village, local honey, yogurt – BTW, did you know Dannon is a French company? I didn’t …). Coming down the street is a big John Deere farm tractor pulling a huge trailer. 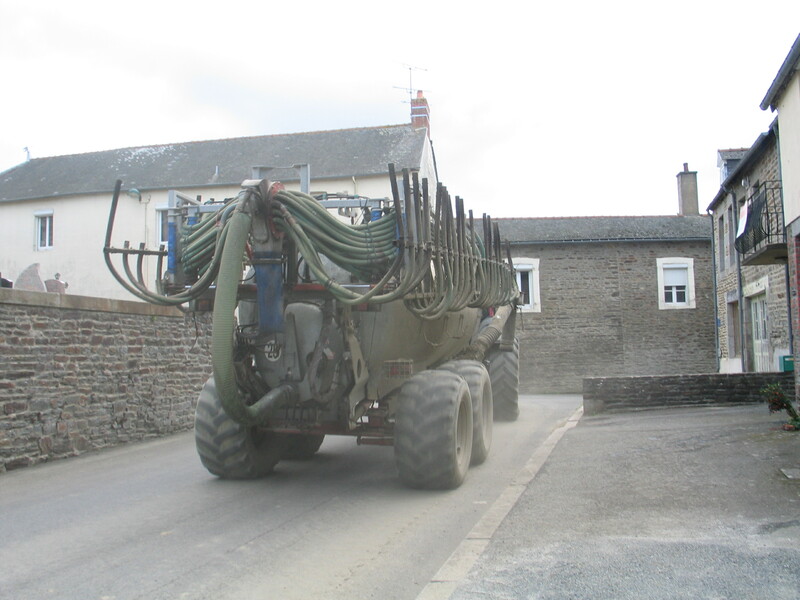 Coming up the street is a big Massey-Ferguson farm tractor pulling another huge trailer (yes, French agriculture is to a large degree powered by equipment made in North America). They meet in front of our house. The street isn’t wide enough for both to pass. These guys know each other, of course, so they start to jockey their beasts around to make room. But what struck me was their respective loads. The green John Deere is hauling a trailer filled to overflowing with tons of steaming cow manure. The red Massey-Ferguson carries a massive tank with two folding arms equipped with a slew of hoses and nozzles. Around here, that means “pig slurry,” which is pretty much what it sounds like: liquified pig waste. By this time of year, the wheat and canola has been harvested, as has been much of the corn. So my neighbors are fertilizing their newly-finished fields and either planting winter cover crops or leaving them fallow till spring. And in a region where cows and pigs are the big item – even most of the grain grown here will be fed to livestock – fertilizer means manure. So, in September, godamighty, we’ve got manure. The loads of cow poop and the tankers of pig slurry are unloaded on the fields, returning their nutrients to the soil, continuing the Grand Circle of Life. It’s all very organic and all.